Here is an image from <www.gobant.gov.co>. 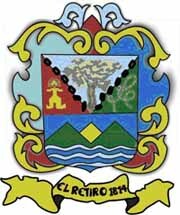 I believe the flag is charged with the Coat of Arms, although I do not know the colors of this town. Here is image of the Coat of Arms from parking ticket. In <www.idea.gov.co> there is a little flag of El Retiro. This flag has 18 stars in the green triangle, located in the internal borders of the triangle. In <elretiro-antioquia.gov.co>, the flag appears with 21 stars, not 19. Flag Overview: The white background is a symbol of the peace and the tranquility that reigns inside the municipality people; over this background, appears a green triangle, symbol of the hope that covers our people, the progress and improvement; and the stars are the number of the sidewalks that composes the Municipality of El Retiro.